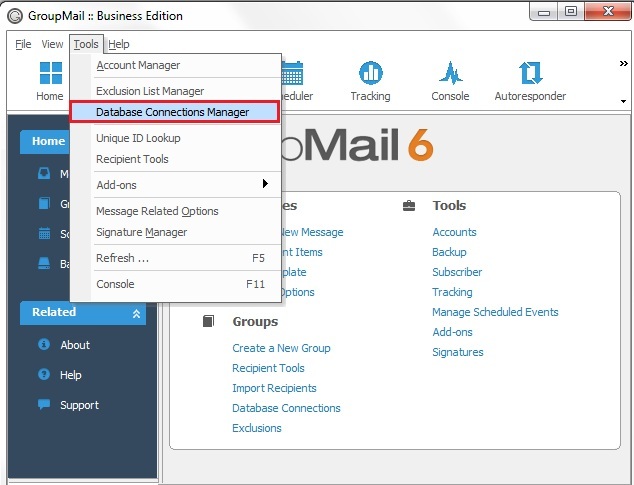 Using the GroupMail Business Edition, go to the Tools Menu, Database Connection Manager. Click on the New Button to create a new Database Connection. 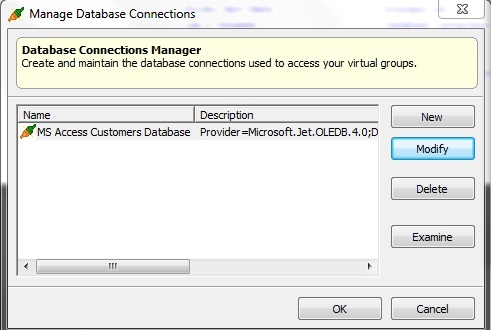 For this example we will connect to a Microsoft Access Database called Customers. The Database can be stored locally on your PC or a shared Network drive perhaps. 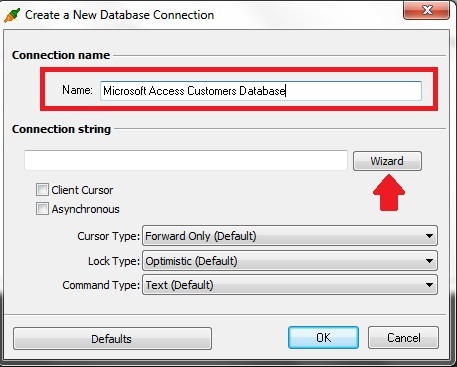 Specify a Name for the Database Connection and then click on the Wizard Button to create the Connection. The table below lists some of the more commonly used databases together with the driver that should be selected. If the required provider is not displayed in the list you may need to download and install either an OLE DB Provider for your database or if one is not available then an ODBC Driver. These downloads should be available from your database producers website. 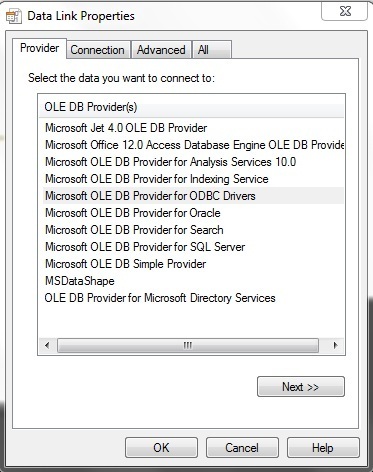 Select the Microsoft Jet 4.0 OLE DB Provider and press Next. On the Connection Tab, you can browse to your Database File by clicking on the Browse …� button. Now please click on the ‘Test Connection’ button to ensure it works. If the connection is successful the following message is returned. 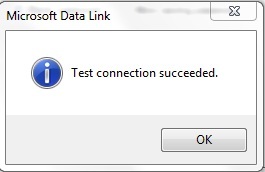 Choose OK on the Microsoft Data Link screen, and OK on the Data Link Properties screen to return to the Create a New Database Connection. The connection string to your database is now specified. There are a number of other options available, the two important ones are Cursor Type and Lock Type. For most configurations set Cursor Type = Static and Lock Type = Optimistic. If this does not work then try ticking the Client Cursor option. 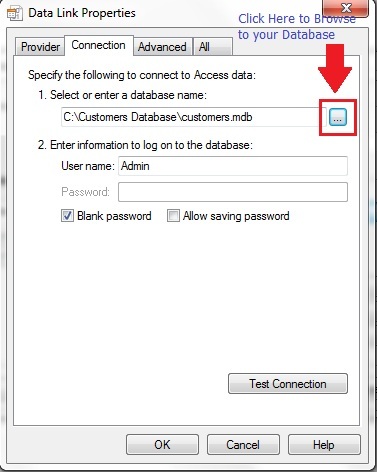 Forward Only – This is the default setting, this option is supported by most databases, however is not recommended for use with GroupMail as while it can be used to display the data returned from the database, attempting to perform searches and/or modifying the data will result in errors. Static – (Recommended) This cursor type offers the best performance when communicating with the database so if the database supports it this should be used. KeySet – Should only be used if Static option is not supported by the database. Dynamic – Should only be used if Static option is not supported by the database. Optimistic – (Recommended) Use this setting if you want to give GroupMail users the ability to modify the underlying data in the database. Note that using this setting does not guarantee updating capability as it may not be possible due to the way the group is defined, underlying security privileges or that it is simply not possible using the current data source. Read-Only – This setting is useful when you do not wish the GroupMail user to update the underlying data in the database. Batch Optimistic – Behaves in the same manner as the optimistic setting, if the underlying database supports this option. Pessimistic – No noticeable difference when using GroupMail than using the optimistic setting if the underlying database supports it. It is recommended that the other settings are left at their default values i.e. 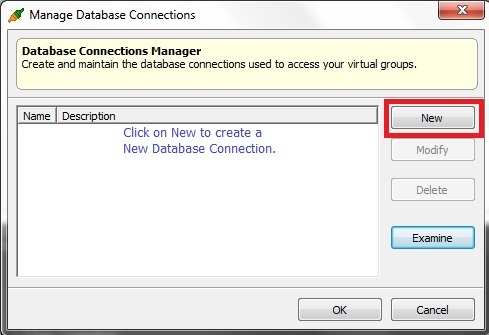 The database connection to your MS Access database is configured! You are now ready to create an� External Group and link GroupMail to your MS Access Database.